Home > Bar Code Scanner Batteries > #L345010-2PDT : 7.2v Li-ION battery pack for CHAMELEON & SYMBOL scanners. #L345010-2PDT : 7.2v Li-ION battery pack for CHAMELEON & SYMBOL scanners. The L345010-2PDT is a 7.2v 1800mAh Lithium ION battery pack for CHAMELEON & SYMBOL bar code scanners. Fits the CHAMELEON RF FL1400; Symbol PDT7500, PDT7530, PDT7534, PDT7540, PDT7542, PDT7546. 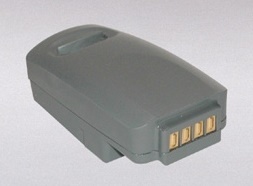 Dimensions of battery: 3.34" x 1.78" x 1.08". Replaces original battery #s 21-36575-06, 21-38602-06, 21-40951-06, 21-65782-06, 29-40951-06. This is a special order item - please allow 10 business days for delivery.